Although I specialise in designs for weddings I also create lots of other unique items of jewellery, adornments & truly personal gifts for every occasion ... Frankly Unique can be your solution to every gift or treat dilemma throughout the year! You've found your dream dress now let me design the PERFECT accessories to complete the picture! 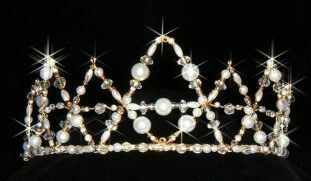 Most tiara companies produce a range of designs and these can be varied to suit your requirements. Still the same basic design but perhaps a change in the colour of the beads, made in silver rather than gold. What I do is much more personal than that. It's all about getting the detail right so the "big picture" is just perfect. How do you want to "look" on your wedding day? Is the keyword "Fun", "Classical", "Elegant", "Outrageous", "Minimalist"? Do you want to make a real statement with your outfit? The more I learn about your dreams for the day the better I can create a design that is exactly you. Most of my designs are shown as tiaras but please don't think that is the only possibility. Far from it! 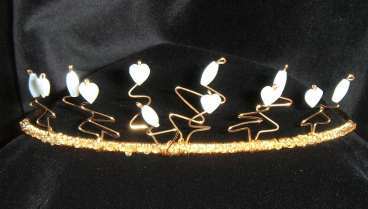 Designs can be created as Crowns, on Combs, Barrette Slides, Hair Clips, "Clippy Clips", "Springs" to dot around the hair. Styles can be worn at the side of the head or at the back, across the forehead.....Tell me what you want and if it is possible I'll do it!! I have tried to make this site informative, inspirational and easy to use. If you want to find out more about a particular design click on the photo. There are loads of key word links built in to the text so "hover and click" to find extra info, hints and pictures. 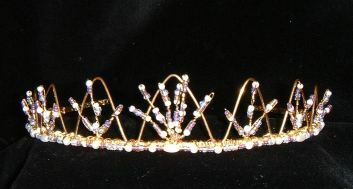 Many of the designs featured use colour - something not always associated with bridal tiaras. Of course I can use ivories, whites, creams, golds & silvers to create limitless designs. One tip - if you want to print out all the text & photos set your printing to landscape to capture all the images. I use a variety of materials to create my designs - from the most delicate glass beads, real pearls, gemstones, Swarovski crystals to acrylic stones in fantastic colours. Some designs use beautiful paper or "silk" flowers. Inspiration comes from all sorts of things - a Salvador Dali image, an elegant film star, even a name or profession. I have created designs to reflect the passion of the groom's hobby or an undying love for a soccer team! It really is possible to have a beautiful design that carries a very special message in a subtle way. Planning a wedding can mean you suddenly have to make decisions about things you weren't even sure you had an opinion on! It can all get pretty daunting. But the bottom line is you want it to be perfect and absolutely "Your Day" and in my experience the success is in the details. As a Bride you can choose the most beautiful, flattering gown but if the finishing touches aren't just right it won't quite have that "wow" factor. 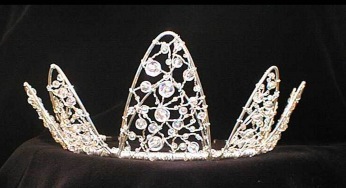 Having said all that the absolute number one key to a perfect tiara is simple - does it suit you? It has to be right for your face shape, hair type, colouring & your overall proportions as well as the shape of your frock. Once that is right the actual detail of the design can "say" whatever you want. All sounds easy but when you think about it how lucky would you have to be to find that elusive combination of a style you love, in the exact shade you are looking for, the perfect height design, in a shape that suits you.... oh, and don't forget comfortable too! It is undoubtedly simpler to try on a few tiaras while you are selecting your gown and for sure one of them will be fine, maybe even lovely, but the odds are it is unlikely to be perfect. I don't market any of my designs through Bridal wear shops because that's not what FRANKLY UNIQUE is all about. I don't want to loose the personal touch of working together with a Bride to create something exactly right. I am passionate about perfection and I believe that there is merit in good design even in something as frivolous as a tiara. Lets be honest you probably will only ever wear it once but that is part of the magic! A little piece of that dream of how you want to look on that fantastic day. I'm in danger of making it seem as if commissioning a FRANKLY UNIQUE design involves huge amounts of commitment and time on your part and that's really not the case at all! So how does it work? Well, I usually say once you have selected your frock then that's the time to turn your attention to choosing your head-dress. This is perhaps a good time to mention that as I design & make all the pieces myself the number of commissions I can accept at any one time is obviously limited. If you have decided you want a FRANKLY UNIQUE design but aren't quite ready to start discussing the fine details then I will happily reserve a slot in the schedule for your commission. Ideally I like to begin the design between 6 & 3 months before your wedding date. This gives plenty of time to get everything perfect without rushing. It is of course possible to work with a shorter time span but this will largely depend on the complexity of the design and is also more difficult if you are getting married at the height of the season. I work from home so you can arrange an afternoon, evening or weekend appointment to suit you. Come along for a relaxed chat & feel free to bring whoever you want to help you make your decisions. I will first go over all the questions which will help me picture the look you want to achieve. If you have a photo of your gown, fabric swatches, ideas of styles you like - anything at all, not necessarily even head-dresses, bring them along. Typically the initial design consultation takes around an hour or 90 minutes. 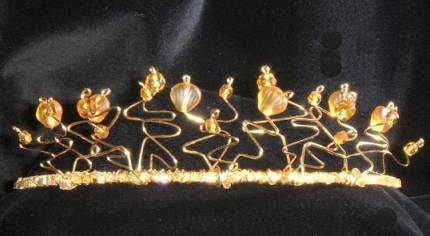 I have a selection of tiaras for you to try on. Different shapes, some large designs, some modest, various colour combinations, different beads and materials. These can be used as a jumping off point for a unique design or maybe you'll like the overall style of one, the beads of a 2nd, maybe the proportions of a 3rd and the width of the decoration field on yet another. No problem - we can discuss all the options. I'll also give you a "ball park" figure for prices on the various options. 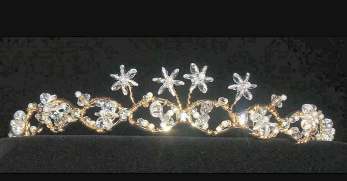 I will also take this opportunity to custom fit the undecorated tiara band. Most of us aren't really used to having things specially made for us and it is only human to think "What if I don't like it when it's finished?". Firstly I can honestly say that has never happened with a FRANKLY UNIQUE tiara. Because I spend time listening to your plans and getting to know a little about you by the time I start work on a design for you I'm already confident that it'll be something you will feel comfortable with. If at the initial design consultation you are not 100% sure of any element of the design I will make up samples, find different beads for you to look at or try out several ideas. These can always be posted out for you to mull over in your own time. Once the design is well progressed then we'll arrange a second appointment when you will have the opportunity to try on the partly completed design. This will not only give you a better idea of how the finished piece will look but if there are any elements that need changing or "tweaking" we can discuss them fully. If you are unhappy with the result at that stage - or indeed at any stage then I will go back to the drawing board and start the design from scratch. When I say I'm passionate about perfection I really mean it. I never, ever forget how important this day is to you. I treat every commission with as much respect and commitment as I would if I was creating the design for my closest friend. It is one small element of your special day but it deserves nothing less than the very best. I am designing this website myself & it is far from complete. The quality of the photographs featured isn't perfect but I have had to compromise between the crispest quality and download times taken for them to appear on your screen. It is also a dilemma deciding whether to picture designs being worn or on an anonymous black background which makes the detail easier to see. One of my aims for the future is to include a "Wedding Album" featuring brides wearing their FRANKLY UNIQUE designs and to include a little of the story behind the inspiration for those designs. Please come back and visit the site to see new additions. Whether or not you have chosen a FRANKLY UNIQUE design for yourself I can create complimentary styling for your attendants. Anything from classic looks to the most trendy ideas in colours perfectly matched to their frocks. If your bridesmaids are a mixture of ages, differing proportions or maybe have very different hairstyles I can design "variations on a theme" - beautiful pieces that will all look fabulous together. 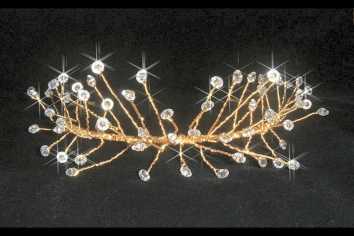 As with the bridal designs I can make tiaras, hair pins, clips, barrette slides - any number of different ways to wear the decorations. A great look is a number of individual pieces worn dotted about the hair. I work these on tiny springs or clips which grip on to the hair so they look as if they are "floating". These work beautifully on long hair but also just as well on short styles or "up" dos! I usually suggest 3 medium or 5 small pieces but even a single piece can look stunning. Tip; A nice idea if you are having two or more attendants is for them to wear their hair decorations on opposite sides. Makes for nice composition in the photos! For simple designs, which would look lovely on bridesmaids, take a look at my ANGELS range. Created originally for First Communion wear several of the styles are available in ivory and some can be customised to include coloured beads to match dresses. The more involvement I have with weddings the more convinced I am there are 2 distinct types of women when it comes to hats - Lovers & Loathers! Some relish the idea of having the perfect excuse for a fantastic new hat & enjoy every moment of wearing it. Others dread the very idea. From the nightmare of finding the perfect colour & the pain of choosing a shape right through to the brim-clashing & discomfort on the big day. Then there are the added hassles of sudden gusts of wind & the inevitable "Hat Hair" when you finally get to be free of it at the reception. If you fall in to the "Lovers" category then brilliant! If you are a "Loather" it can really be a blip on an otherwise fabulous day. The dilemma is as such an important member of the bridal party you really need something extra special to finish off your carefully chosen outfit. Unless it is a very informal wedding you probably won't feel quite right without "something"! Well, you are exactly who I had in mind when I came up with the idea for these pieces. These particular examples are made on a lightweight metal tiara band, custom fitted for incredible comfort. This gives a nice comfy but secure fit and it can be easily concealed by your hair so you see the decoration not the band. However it is perfectly possible to make designs on combs, barrette slides, hair clips or even springs to dot around your hairstyle. As with all my ideas this is not a range but a jumping off point for a style especially for you. I can match the beads & decorations exactly to the colours of your outfit and the shape & proportions can be made to suit you individually. 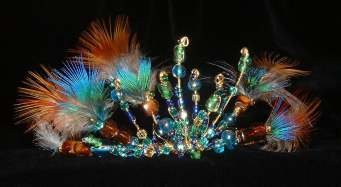 I can create a style using just beads if the feathers aren't your thing or I can use all feathers if the beads don't appeal. You are in the fortunate position knowing what the bride & her attendants will be wearing in their hair so you know the styling will be completely different. No danger of you appearing to be trying to compete! And anyway she can be just as involved with the design consultation as she'd would be with if you were choosing a traditional hat. Don't forget you can have your jewellery designed to match. I can create a really stunning set that will look fantastic, go perfectly with your outfit - you can relax , enjoy the day & know you look great! Tip; Another advantage of a hair decoration, rather than a hat, is it won't throw a shadow across your face! I know of several women who were disappointed to discover that in all the photos the brim of their hat had cast a shadow which obscured their eyes. They appeared as a hat and a chin area in all the precious portraits. 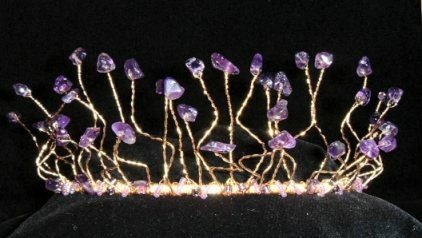 FINISHING TOUCHES - To protect your tiara (& also just because it looks nice!) it comes in a special pretty box. I will personalise it with yours & your fiance's initials & the date of your wedding. A little extra that's nice to keep. Same, too, for the bridesmaids & all the jewellery comes in appropriate packaging which is personalised also. I can create a truly unique Christmas tree decoration, based on the design of your tiara. If you drop a hint to your other half I can incorporate it into a card - perfect for your 1st "married" Christmas, Anniversary or Birthday! Just give him the e-mail details & I'll do the rest!! 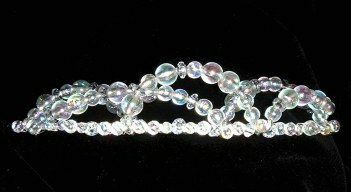 I create beautiful keepsake Horseshoes to reflect the design of the bride's tiara using the same crystals & beads - frankly unique!! Individually designed gifts perfect to say 'Thank You' to the mums - a lasting alternative to the traditional bouquet of flowers which all too often sadly wilt in the corner of the reception venue. I can create a lasting memory of your wonderful day that is totally unique. Boxed & beautifully presented. WEDDING FAIRS - Great for ideas & contacts but if your fiancé is with you, and you want to retain that air of mystery until the day, it's just about impossible to make any decisions about any part of your outfit. I have jokingly said that I'll supply a virtual reality headset & earphones for him so he can watch the sport for a few minutes while you can have a try on of various designs and talk over your ideas! But maybe a simpler way is browse through this site leisurely then contact me to talk over your ideas or make an appointment for a design consultation. The chances are, if you live in the English East Midlands, you have probably come to visit this site because we have met at a Wedding Fair. In which case you will have seen a selection of the designs featured on this site. However there are many more here that I won't have had with me at the Fair. Please bear in mind my designs are in no way a standardised range. I have a selection of one-off ready made styles which illustrate some of the possibilities of shapes, proportions, colours etc. But if you choose to commission a FRANKLY UNIQUE design it will be just that - FRANKLY UNIQUE! CUSTOM FITTING - Comfort is a key factor in all FRANKLY UNIQUE designs. My philosophy is "Know you look fantastic then forget you are wearing it!". No need to keep adjusting or fiddling, no bits that dig in, no need for dozens of grips or clips to hold everything in place. If you've worn a tiara before, maybe as a bridesmaid, the chances are you felt it perched on your head the entire day. If the metal band dug into the sides of your head you will have discovered, the hard way, that there are pressure points there sure to give you a headache almost instantly. So how do I guarantee comfort? By custom fitting the metal band to the shape of your head before I even start to put any decoration on it. This has the terrific advantage of dispensing with the need for combs or clips to hold it in place. Occasionally, on a larger decoration tiara, I might add a couple of small wire loops for your hairdresser to use as fixing points but this is very rarely necessary. When the design is complete I do a thorough check to ensure it is still firmly secure & 100% comfortable. You can greet even your tiniest guest or dance the night away assured it'll happily stay put. With no grips etc. it also means that during the course of the day you are free to slip the tiara off, re-do your hair & then simply put it back on. MAIL ORDER - FRANKLY UNIQUE is not intended to be a slick, fill out an order form sort of operation. But if it isn't practical for you to come along personally it is still perfectly possible for me to create a design especially for you. Consultation can be by phone or e-mail & I can post out sample beads & images - all part of the service! The finished tiara, jewellery or whatever pieces you have commissioned, will be mailed to you at cost whether it is within the UK or abroad - I'll make sure they are all carefully packed up and well protected! There are a number of methods of payment available. Just contact me & I'll talk you through the options if mail order is the most convenient alternative for you. PRICES -As each design is unique it is impossible to give a price until I know what sort of beads are to be used, how many hours the style will take to create etc. But to give you an idea £100 is a pretty good price guide for a commissioned bridal tiara. They can work out less than this - a simple design might be around £50 - or, if using precious stones such as Amethyst or real pearls, or a complicated style, could work out to £150 or more. During the design consultation I will be able to give you a much better guide on price and indicate any ways it may be possible to reduce costs. Styles for Bridesmaids are usually simpler so naturally that is reflected in the price. The featured decorations suggested as an alternative to hats are typically start at around £50 but again price depends on the beads selected, complexity of design etc. Jewellery prices - Typically necklaces are around £30 but start at £15, 9ct gold or silver earrings £15-£30 & bracelets around £25-ish. 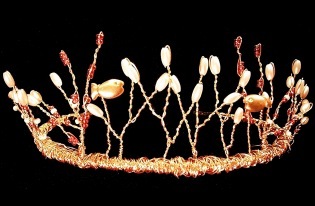 HIRE OF TIARAS & JEWELLERY - this is sometimes possible with studio pieces. If you are interested in hiring a design call me to discuss it & if I can oblige I will! HATS - I now carry a selection of hats & hair decorations for hire or purchase. Please call 01530 224579 to discuss what you are looking for. If I haven't already got suitable designs in stock I can often buy in something special for you to consider. Typical hat hire prices are around £25 & depending on the date(s) you require I try to be as flexible as possible about loan period. All pieces are supplied in appropriate boxes & there is an additional deposit which is fully refundable when you return the hired item in it's original condition. As my studio is located beside my home appointments can be arranged out of normal shop opening times for added convenience. If the design is appropriate I can also undertake a revamp on a client's own hat. Anything from re trimming to perhaps swathing fabric from the intended outfit or adding beautiful Swarovski crystals. I also create unusual design hat pins. 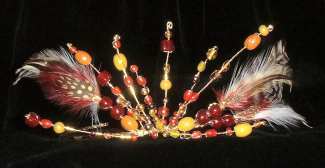 Of course I create all sorts of hair decorations from feather & beaded styles to clips & add ins. Basically if you are after a piece to 'dress' your hair I can probably help! Additionally I also offer some beautiful shawls, wraps & accessories in luxury fabrics. I am a great advocate for dressing a new outfit to create your own style or restyling a favourite you already have - making it look totally fresh & new with clever use of accessories. A beautiful outfit shouldn't be dismissed for a special occasion just because it's been 'seen before'! If you have a fabulously cut suit or dress that makes you feel a million dollars take a fresh look & reinvent the look. Consider accessories in a totally different colour than you've worn with it before. A beautiful chocolate brown outfit will look so different styled with a soft sage green sinamay hat & silk beaded shawl draped around the neckline. Consider a real statement colour hat like rich turquoise with it & the look changes again. Alternate with a fabulous copper hat complete with ostrich decoration & a silk chiffon shawl with slubbed tread detailing & nobody is going to even think they've seen that dress before! Add the element of individually designed jewellery to tie in the outfit colour & accessories colours to make the transformation complete! By the way custom jewellery is a brilliant way to get that complete coordinated look to an outfit without going down the 'bought it all from the same manufacturer' look. Recently a client came to me with a prussian blue & off white softly draped silk 2 piece which she wanted a hat to match. Whilst the outfit looked lovely on her neither the blue or off white in a hat complemented her complexion. But when she tried on a glorious fuchsia pink sinamay design the soft glow it threw on her cheeks lit up her face. I designed necklace & earrings using Swarovski crystals in a combination of fuchsia, montana blue & white opal to 'tie' the hat to the outfit. Instantly a subtly coordinated look was achieved with a nice flow of the fuchsia in the jewellery leading the eye down from the hat to the contrasting colours in the 2 piece. The added bonus was there were then 3 possibilities when the client was deciding on shoes & bag as dark blue, off white or the pink all worked equally well! found shoes that fit well but just don't have the 'wow' factor? I can customise them to perfectly match or complement your outfit! they can be transformed from every day footwear to something really special - AND THEY'LL STILL FIT YOU & BE COMFORTABLE!! ... transform handbags, clutches ... if it comes under the heading 'accessory' I can probably help! Please contact me to discuss what's possible. THERE HAS NEVER BEEN A BETTER TIME TO ACCESSORISE!! great statement pieces created to perfectly suit your outfit, it'll sit in exactly the right place for your neckline, in the colours you love & made especially for you! Want to make it easy this Christmas but need a thoughtful gift? Then how does this sound? how much you spend can be kept a secret! It's also a bit like leaving the price on a gift when what you've spent is trumpeted all over it! SO HOW DOES A FRANKLY UNIQUE VOUCHER WORK? You let me know the message you would like to include & I prepare the voucher presented in a beautiful gift box, trimmed with ribbon & a diamante buckle, with a fully personalised message inside. This costs £3.50, or £5 with organza bag for the box to slip in to so NO NEED TO EVEN WRAP IT!! You can, of course, opt for a simple voucher presented in a gift card wallet & this is free of charge. NO RISK? I contact you AFTER the recipient's design meeting & let you know the exact cost of the piece or pieces chosen - which is often less than the set limit, certainly not more. Only then do you pay. 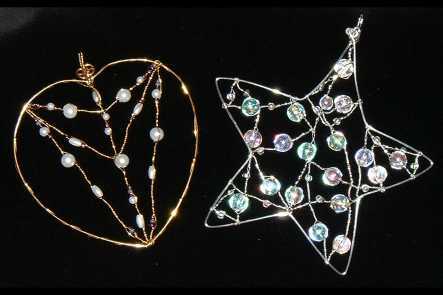 I make up the design & arrange for either you to collect or if you prefer the recipient can do so. If in the unlikely event the person who you've arranged the gift for doesn't find anything to their taste (never happened yet but just in case!) then there is nothing further for you to pay. Hopefully you will be pleasantly surprised that even though Frankly Unique designs are one offs the price tags are more High Street than Haute Couture! I'm very aware pricing is a key factor whether choosing your wedding tiara, a gift or just treating yourself because you want to! But because the very essence of Frankly Unique is everything I create is just that ... UNIQUE ... it is just not possible to have a set price list. So much depends on which stones or crystals are used, how complex the design is, who long it will take to create. But hopefully the details below will give you an idea of typical prices & rest assured before you decide to go ahead to have a piece made I will discuss all the price options with you. I am also happy to work 'the other way around' - you set the budget & I will give you achievable design ideas. Unlike many designers I do not have a separate pricing policy for weddings! It seems that as soon as the 'W' word is mentioned zeros start to appear! You don't have to worry about that with Frankly Unique. In all cases, even if you can't get to my studio in Osgathorpe to chat through all the details, I am at the end of the phone or email happy to answer all your questions. Oh, nearly forgot - no annoying standard rate for P&P! I charge only what it costs me in stamps & packaging.